Da Capo Press, 9780306820724, 392pp. 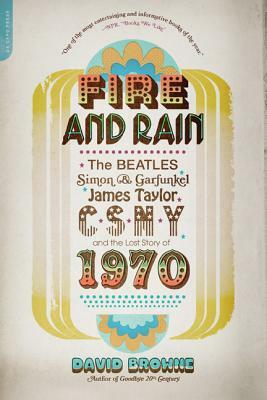 Set against a backdrop of world-changing historical and political events, Fire and Rain tells the extraordinary story of one pivotal year in the lives and music of four legendary artists, and reveals how these artists and their songs both shaped and reflected their times. Drawing on interviews, rare recordings, and newly discovered documents, acclaimed journalist David Browne allows us to seeand to hearthe elusive moment when the '60s became the '70s in a completely fresh way” (Mark Harris, author of Pictures at a Revolution).